Communication between our team members is the key to success. To provide better quality products to our customers we use professional platforms and services like Slack - an instant messaging and collaboration system. It offers real-time messaging and archiving that allows our teams to have all communication in one place. Slack allows us to create groups of users or to select users who want to participate in the conversation and also creates a single unified archive accessible through powerful search. Our team benefits from a unified way of communication that combines all channels the team members are using but also stores them in easily accessible databases. Members of our team can get tasks completed on intuitive and easy-to-use dashboards that are highly customizable. Slack provides robust preference features – this allows our employees to make Slack their own. Speaking of customization… The Slack App Directory offers a wide variety of plugins that are essential in our everyday work. They can automate a lot of repetitive tasks you do every day or solve issues you never knew existed. Let’s start with Polly. Polly is a tool that allows us to create quick polls on a particular team or channel and users to vote directly in Slack and view results in real-time. Polly’s features can automate data collection and provide ongoing analytics from our team members with recurring polls. We can use it to measure the mood in our team or ask other collective questions like “Where should we go on our next integration trip?” or “Pizza or tacos?”. Do you still ask your employees to make a special paper to take a leave of absence? Or do you keep counting how many days off you still have left? These dark ages are over – please welcome Calamari. Calamari makes leave management easier. Your employees can make online leave requests which you and your HR team will later get via email or notification. The request shows how many people will be having a leave at that time so you can make a better decision. It features paid time off tracking, automatic leave calculation and multilevel approval process. Everything is done within the realm of Slack and Calamari’s online platform. Calamari can also keep a record of the time of work of your employees by asking them to sign in to Slack or check-in at workplace using Calamari’s app. Using Slack’s huge app store it is possible to solve some of the trouble with using different services for every specific task by simply having them all in one place – services like live chat. 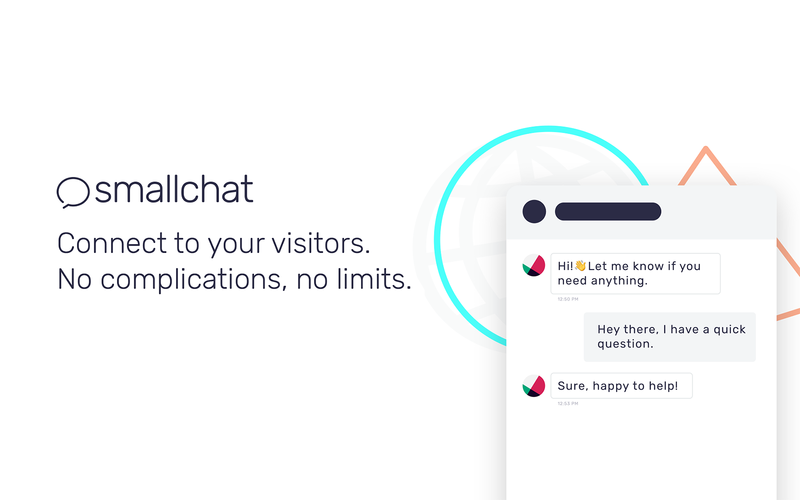 You no longer have to use other platforms to chat with your customers or visitors – Smallchat lets you do to that and much more from Slack’s platform. Each conversation creates a new thread, allowing our team to manage them all from one place. Smallchat helps us with providing a better experience by creating a direct line of communication between our team and our customers. To put in simple words – Droplr is a file-sharing tool created especially with Mac, Windows and Slack users in mind. It is perfect for effortless, quick and easy “drag & drop” file sharing with your friends or co-workers. 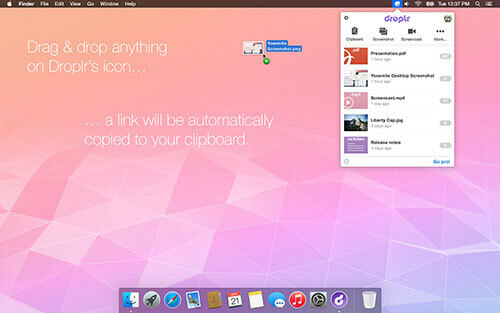 Droplr allows you to take screenshots and then quickly mark them with annotations or notes. Everything you share gets a short link that can be previewed in the browser, Microsoft Office, Twitter, Facebook, you name it. You can even share mockups from Photoshop or Illustrator using third-party Adobe integration! Howdy – virtual employee, a powerful tool that allows automating tasks like meetings in our team. A team member asks Howdy to start a meeting. Howdy speaks in private channel to each participant of the meeting – their responses are collected into a report which is then sent to the leader of the team. As an example, we use ‘checkin’ script which is scheduled for every day of the week to check if every employee is ready to work and what is their current work status. Howdy asks what each employee had to do, what has he or she done so far and what is his or hers workplan for today. Finally, probably the most important plugin we use on Slack platform – Giphy. With a simple command, it can search and find funny gifs and pictures for almost every occasion. We often use it in conversations between team members. We also would like to mention a very cool platform called Zapier, which connects apps we use every day like Gmail, Dropbox or even social media services with Slack. It improves our workflow by automating some of the tasks we had to do manually before like uploading Gmail attachments directly to Dropbox or sharing new posts on our blog to our Facebook/Twitter/LinkedIn page. One of the rather unusual uses of Zapier is monitoring and analyzing your competition’s tweets and posts – if you want to know more about it click here. As you can see, Slack is a platform without which our everyday work would be almost impossible. What are your favorite Slack apps and integrations? Share them with us in the comments! Do you often find yourself taking screenshots just to send them once in a single conversation? Is your desktop flooded with screenshot – which are tedious to look through and move later? The process of saving screenshots, annotating them, and then sharing them with your team doesn’t have to be so manual and complicated. Marker is here to help – an incredibly useful Chrome extension for your employees who regularly share screenshots with teammates on Slack. Capturing your screen, annotating and sending it to a person or channel on Slack has never been this easy. Marker has many uses – from reporting typos and bugs to sharing ideas or interesting articles.